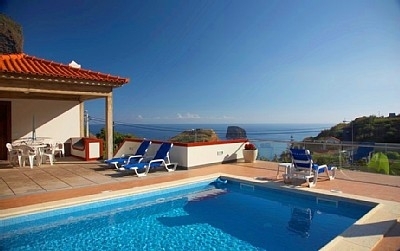 A charming Villa with private and heated pool, enjoying uninterrupted panoramic sea view. The Villa Ricardo is located in a beautiful slope above the entrance of Porto da Cruz. It is a large property with a high level comfortable accommodation in a quiet location, has several terraces enjoying uninterrupted panoramic sea view, and a subtropical garden of exotic fruit trees and small banana trees. The property owner valued a stylish and friendly environment. The house has 3 double bedrooms, (with the possibility of an extra bed and cradle for baby), all with private bathroom (shower) and TVset. In the winter all the rooms are heated by a device that recovers the heat released by the fireplace, and automatically distributes it to the rooms. The sitting-room is equipped with TVset, DVD, Stereo System, Computer, Internet WI-FI, Safety Deposit Box, WC, and the kitchen is fully equipped. Outside you can enjoy the heated pool and the sunbathing area with views to the ocean and the Village. In September, wine is made in Villa Ricardo, by a centennial traditional process. Panoramic sea view from the swimming pool. The entrance of Villa Ricardo. Villa with the exotic garden. Panoramic view to the magnificent 'Penha D'Ã¡guia'. Living room (Computer and Fireplace). Bedroom 2 and the private bathroom. General view of Porto da Cruz Village. The house has 3 double bedrooms, (with the possibility of an extra bed and cradle for baby), all with private bathroom (shower) and TVset. In the winter all the rooms are heated by a device that recovers the heat released by the fireplace, and automatically distributes it to the rooms. All rooms have access to outdoor terraces with views. All the bathrooms have hair dryers.
.: Twice a week the house is cleaned, linen is changed and the rooms are provided with fresh towels :. .::. Minimum stay demanded of 7 nights. .::. Max. Capacity 7 persons. .::. Children OVER 12 years old, pay the adult price. - The use of the Internet in computer's Villa, and the Wi-Fi access from your own laptop, is an extra. - Pool heating - water temp approx 26ÂºC in winter, can be ordered in advance, at an additional charge. Porto da Cruz is one of the parishes belonging to the Machico council. Its name came from a cross (Cruz) that was placed by the explorers on the bay once used as port (Porto). The attractions of this small parish are hidden and you'll have to take a closer look to find them. One of them is the old sugar cane factory, which is still operating, as it was when it started with the sugar production in 1927. Not to be missed is also the place known as Penha d'ÃƒÂguia, an imposing rock that separates Porto da Cruz from Faial. Getting up there might be a challenge, as the road is very steep, but the songs of the birds will help you on the way up and once you get there you'll be sure it was definitely worth. Porto da Cruz is also famous for its wine, (dry red wine made of a type of grape called Americana), this local product is the theme for a celebration happening in September (Festa do Vinho). In Porto da Cruz there are another two wonderful religious celebrations in August.